Successfully Added 810 Lumen LED Bulb - E27 Fitting, 9 Watt, 4000K Light Temp, 25000 Life Span, Built in Light Sensor to your Shopping Cart. Want to save the environment and money at the same time? What better way than with an LED light bulb. This environmentally friendly light sources are perfect for lowing your electric bill and will lower your carbon footprint at the same time. It's a win-win for all environment concerned and enlighten people of this world. This 810 Lumen LED bulb emits light on the 4000K color temperature frequency so you get a natural white light suitable for all locations. Its composed of 18 individual LEDs and has an expected life of around 25000 hours, so you could leave it on continuously for over 2 years. 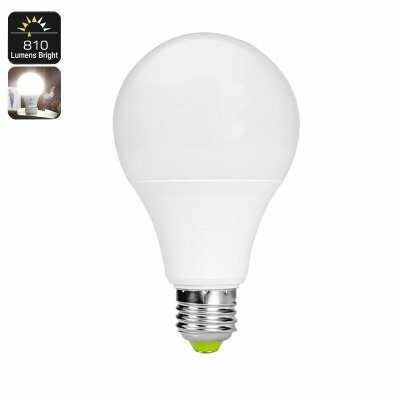 Featuring a built in light sensor this LED bulb will turn on when the ambient lighting falls below 15 lux and will turn itself off once the lighting reaches 20 lux, so it makes the perfect security light or outdoor bulb for your patio, porch or driveway offering a guiding light whenever its required. AS it turns off when no longer needed you won't be wasting unneeded electricity and the low powered 9W LED light offers a great return on your investment paying for itself many times over during its lifetime. This E27 9W LED Light Bulb comes with a 12 months warranty, brought to you by the leader in electronic devices as well as wholesale LED Lights..